FLAGSTAFF, Ariz. (CNS) — An immigrant teacher and White House honoree fears President Donald Trump is undermining the community she has fought to lift up. “It’s only been two, three weeks since he was sworn in and I can see the fear and uncertainty in my students and their undocumented parents,” said Maria Dominguez, who teaches first grade at Rodriguez Elementary School in Austin, Texas. “A couple of parents that I’ve met with this week have mentioned that they’re afraid of what’s going to happen to their children if (the parents) were to be deported,” she said in a phone interview with Catholic News Service. Dominguez said some fear that their children could be placed in foster care and they would not know where they are or how they are doing. Her first-grade students have expressed their own anxieties. She said the U.S. is all they know. Trump’s immigration actions include a substantial expansion of Immigration and Customs Enforcement. He called for adding 10,000 ICE agents to the 20,000 currently responsible for enforcing immigration laws and for the removal of unauthorized aliens. Writing as the U.S. bishops’ point man on migration, Bishop Vasquez has repeated the bishops’ call on “comprehensive, compassionate and common-sense” immigration reform. According to a Pew Research Center analysis, about 3.9 million public and private school students in kindergarten through 12th grade — 7.3 percent of the total student population — were children of unauthorized immigrants in 2014, the latest year for which these statistics are available. About 725,000 students — 1.3 percent of the total — were unauthorized immigrants themselves. Dominguez said she believes nearly all of her students were born in the U.S., but around half of them have at least one parent who is an unauthorized immigrant. Dominguez understands the concerns of her students and their families. For all but the first eight years of her life, she has lived in Texas as a Mexican immigrant without legal permission to be in the U.S.
Dominguez had an opportunity to apply for a summer work program in the eighth grade. But the application asked for a Social Security number that she could not provide. Although disappointed, Dominguez said she remained positive, worked hard in school and became involved in extracurricular activities, including ROTC. After graduating from high school, she went on to earn undergraduate and master’s degrees in education. Dominguez also began teaching Sunday religion classes at her Catholic parish. She still had no authorization to get a regular job. In 2012, she applied for and was among the first eligible immigrants to receive DACA, or Deferred Action for Childhood Arrivals, status. Initiated by the Obama administration, DACA gives temporary protected status to select immigrants who arrived in the U.S. as children without legal permission. 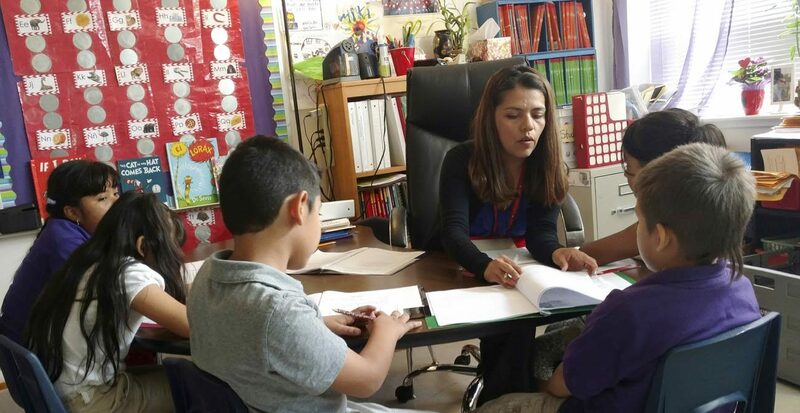 DACA allowed Dominguez to receive work authorization, and she began teaching at Rodriguez Elementary in 2013. Her journey to becoming a teacher was born of tragedy. When Dominguez was 8, her father died in a car accident in Texas, where he was legally working as a welder. Her mother and her four children traveled from their home in Guanajuato, Mexico, to Austin to collect benefits that were owed them as a result of her dad’s death. Their plan was to go back to Guanajuato after her father’s affairs were settled, Dominguez said. Her mother continued to tell her and her siblings that they would eventually return to Mexico. But the family never did. During his presidential campaign, Trump promised to revoke DACA. But he has yet to formally address the programs and the more than 800,000 immigrants it now protects. The paradox of one White House administration honoring the success of immigrants and another potentially stripping it away is not lost on Dominguez. She said her proudest moment was in 2015 when she entered the White House with her mother. Visiting as unauthorized immigrants was something they “could have only dreamed about,” she said. “Walking into the White House and being guests and then being honored and having my mom next to me and making her proud was amazing,” Dominguez recalled. In a 2015 interview about the honor, Dominguez said it is her students who motivate her. After a year and a half of paperwork, interviews and processing, Dominguez received permanent residency status in January. She was sponsored for residency by her husband, a U.S. citizen. Although she now has authorization to work and live in the U.S., she worries for her mother and her siblings as well as other DACA recipients who have made positive contributions to U.S. society but remain aliens in the eyes of the U.S. government. I understand the concerns of people who do not want to return to Mexico. But they have to also understand that they broke federal immigration law when they entered and stayed in the U.S. illegally. Breaking the law is breaking the law. This has to stop somewhere. The solution is not easy and not everyone will be happy with it, but we can’t just open the country’s doors to whoever wants to come here. I am not a mean or heartless person, but violating a federal law is not right.